What would you do, if in these last days of Lent, Jesus came to you and said…”we need to talk”? He would find a comfortable place for you both to sit. He would look you in the eye and say…”don’t be afraid.” He would then explain that He understood how hard it was to trust, to follow Him, but that He just wanted this Lent, this Holy week to really open your life to the promise and joy of His resurrection..to open your life to Him. Maybe you would feel compelled to start sharing the struggles, doubts, fears you had, how sin was a battle. He would lift your head ..look you in the eyes and say..”I forgive you, I give you my peace, just follow me”. Such an experience would, literally, beyond doubt, change our life for the rest of eternity. Yet it is so often so hard to sense God’s Presence in our lives. To KNOW that He is with us, to know what He really wants us to do. In today’s Gospel, the experience of the raising of Lazarus from the dead is shared. In this vibrant message we are given an important lesson in sensing God in our life. Lazarus had died. Jesus, close friend of Lazarus, and his sisters, Mary and Martha was days away. When Lazarus had fallen ill they had sent for Jesus, TRUSTING that He could do something. Jesus had delayed His response. Lazarus was dead. Mary, Martha, their friends were heart broken. Not only had Lazarus died…but they had trusted Jesus to come, to heal as He had so many others. Where was He? Where was God? Their feelings..their sense of God’s Presence was seemingly destroyed. But the Lord had a greater blessing to share. Jesus arrives to find Martha confronting Him in her grief. Mary, the others, bound in mourning. They go to the tomb. Lazarus has been dead and in the tomb for four days. Jesus weeps. SEEING His tears, they then HEAR him say “remove the stone”. Martha, ever practical, recoils, telling Christ, “he’s been in the tomb four days..He will STINK! They HEAR, again the Words of Christ: “…Did I not tell you that if you would believe you would see the glory of God?” Their fearful sweaty hands remove the cold hard stone. 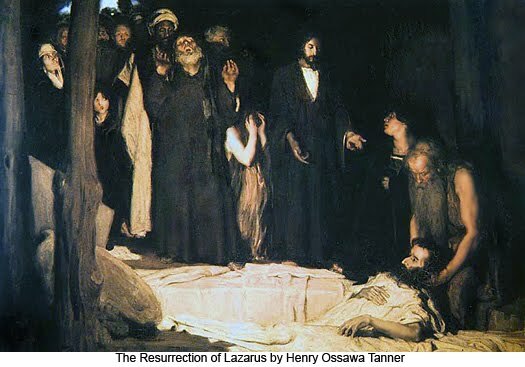 “LAZARUS COME FORTH” They all HEAR Christ call. Lazarus comes forth. Again HEARING HIS WORDS…”Loose Him”. They FEEL the cold clothes of the dead. Then they SEE..LAZARUS is alive! Using all of the five physical senses Jesus lead Mary, Martha, His disciples, the mourners to see beyond their vision. To sense beyond what they could feel. So He would do today these many centuries later. He longs to sit with us, look into our soul and call us to… Himself. In simple trust we place our hands in His nail-scarred hands, seek Him to touch our ears, ask that we may see as He sees, to smell the holy fragrance of holy love in the scent of a rose, to taste His goodness in His Body and Blood we come to the place of Mary and Martha…to truly sense and know God’s Presence. St. Paul shared this lesson in another way..we are called to grow beyond life in the flesh (what we just physically feel) to life in the fullness of the Holy Spirit. As our souls are filled with God’s Spirit He then brings us to know His touch..those words of Christ…”don’t be afraid..be at peace”.